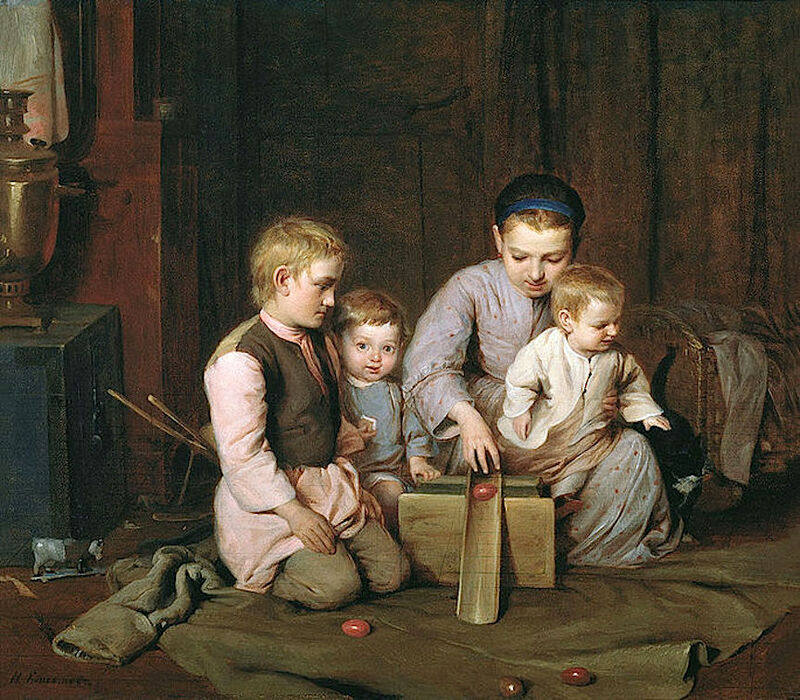 Nikolay Koshelev, “Children Rolling Easter Eggs” (c. 1885). Courtesy Russian State Museum, Saint Petersberg, Russia. Easter eggs are not unique to Christendom, but find a match in the eggs painted by ancient Zoroastrians and modern Persians on occasion of Nowruz – the beginning of the new year, celebrated on the spring equinox. For the student of ancient religions they are a bit of a curate’s egg, as next to nothing is known about the meaning and the origins of the practice. The Persian and Christian rituals – for that is what they are – likely share historical roots, because among Christians the decoration of eggs at Easter first came into vogue in Mesopotamia. While it is easy to imagine that it is the hatching of the egg which elicited a comparison with Christ’s emergence from the tomb, the earliest legends – apparently all of the Eastern Orthodox branch of the faith – suggested a link between a red shell and the Saviour’s shed blood instead. But this fails to explain free-style decoration, the Easter Bunny and traditional European activities such as the egg hunt and rolling the eggs down hills. Nor can the association with the Passion explain the analogous custom among the neighbouring Persians. Ab ovo, the Easter egg must have signified something else. At higher latitudes, the longer daylight hours in spring cause hens to resume laying eggs after the winter interval. This behaviour could have inspired ancient cultures to employ the chicken’s egg as a general symbol of fertility and the blossoming of new life after the gloom of winter. Eggs-trapolating to a cosmic scheme, in which the mythical history of the world is modelled on the annual cycle, the winter corresponds to a primordial age of darkness, followed by a ‘springtime’ of creation, when mythical beings illuminated the sky, covered the embryonic earth with verdure and populated it with an abundance of animals. Within their narratives of ‘creation’, the myth-makers of some cultures assigned a prominent place to eggs. The alleged birth of many a mythical king or hero from an egg probably reflected the theme of a ‘cosmic’ or ‘cosmogonic egg’, from which the creator, the sun, the entire universe or all of these were thought to have sprung in traditions from as far afield as India, Polynesia, Mali and Colombia. The notion of cosmic oogeny also thrived in the ancient Near East, notably among Egyptians, Phoenicians and Orphics. Is the Easter egg a distant ritual descendant of the cosmic egg? It seems possible, but the paucity of ancient information urges caution. A chicken-and-egg situation arises. Did the application of existing creation mythology to the seasonal cycle prompt a need to accommodate the cosmic egg, with some settling for spring as the appropriate juncture? Or did vernal greening and egg-laying, conversely, inspire an association with existing creation mythology, enriching it with the image of an egg containing the world’s prima materia? Egged on, comparative mythologists note that the metaphor of the cosmic egg competes with other symbolic expressions of a ‘primaeval enclosure’, such as a womb, a shell, a gourd, a nut and a circular dragon, each of which eventually suffers the fate of being prised open. An oval or spherical container of some sort thus appears to have inspired all of this imagery. What phenomenon could this have been? As argued repeatedly in these pages, the ‘age of myth’ may have been a time when the earth’s atmosphere and magnetosphere exhibited extremely unusual properties, including radical changes in albedo, climate, geomagnetic field structure and auroral morphology. The auroral rings above the geomagnetic poles may have radically changed their geographical locations and diameters, potentially manifesting to humans as the outlines of radiant ‘eggs’ in the sky, with or without inner ‘suns’. During episodes of intense electrical discharging between the ionosphere and the surface, the field-aligned currents forming the caps above the magnetic poles may have pinched into ‘intense-auroral columns’, sporting dramatic plasma instabilities in the process. The American plasma physicist Anthony Peratt demonstrated that such columns may form a string of plasmoids, of which only one or two may be visible for most of the time. The plasmoids would eradiate bright light and often perish in a violent burst. Is this the egg of Columbus? Were the appearance, expansion and explosion of such plasmoids behind the mythological motif of a luminous ‘cosmic egg’ or ‘sun’ and related receptacles? It is an attractive possibility. At the risk of over-egging the pudding, it may even be that the complex filamentary structures of plasmoids seen up-close motivated the decoration of eggs, while the ‘Easter egg trees’ in which German communities placed their eggs hark back to the ‘cosmic tree’, an expression of an axis mundi commemorating the Peratt column as a whole. However, as so often with ‘pagan’ practices in Europe, documentary evidence for these traditions already peters out in the Middle Ages. Be that as it may, the internal consistency of the recurrent themes in the world’s creation myths nevertheless encourages us to put all our eggs in the one basket of a radically different prehistoric sky.